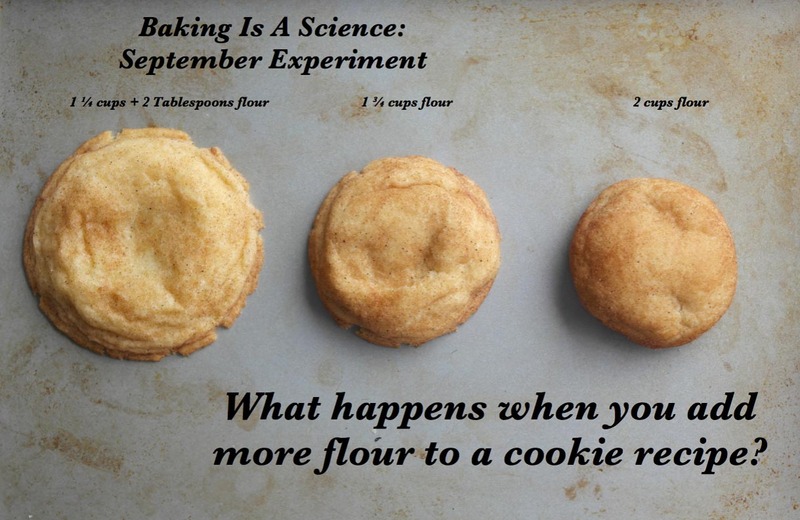 This monthly experiment revolves around flour AGAIN! (Recall my first ever experiment in July.) 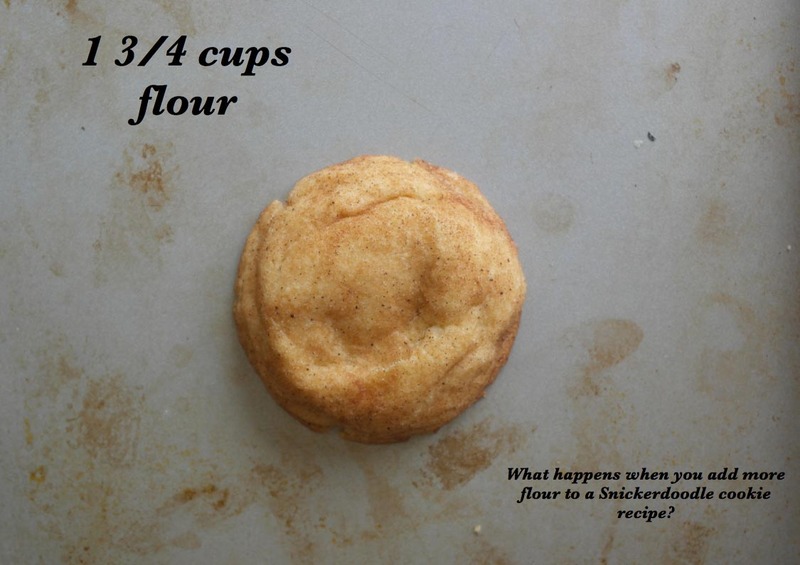 The central premise: What happens when you add more flour to a cookie recipe? I used Snickerdoodle cookies are my test cookie because everyone knows that Snickerdoodles are phenomenal cookies. 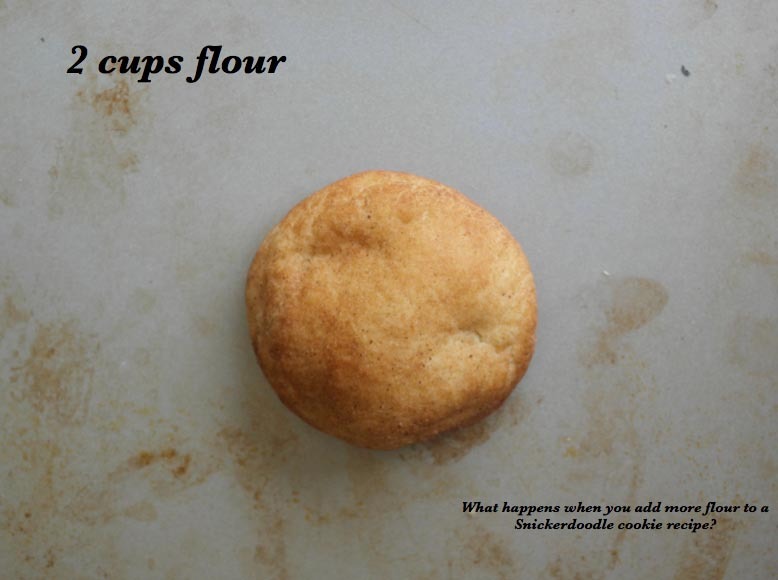 How it all began (also known as the scientific question): Back in the day, when I was a wee little girl, I baked Snickerdoodles exclusively for about a year. Every few weeks, I would whip up a batch of these babies and every time, I managed to make a vastly different cookie. (Thankfully I’ve learned how to make consistent cookies.) One time, I threw all of the ingredients haphazardly into the mixer (even though I’d made these about four times before, I still forgot to cream the butter and sugar first. Go figure. Neurons?) and the cookies turned out fluffy and cake-like. Another time, I halved the recipe and I forgot to halve the flour and the cookies were ultra thick and pillowy. What does this have to do with my experiment today? 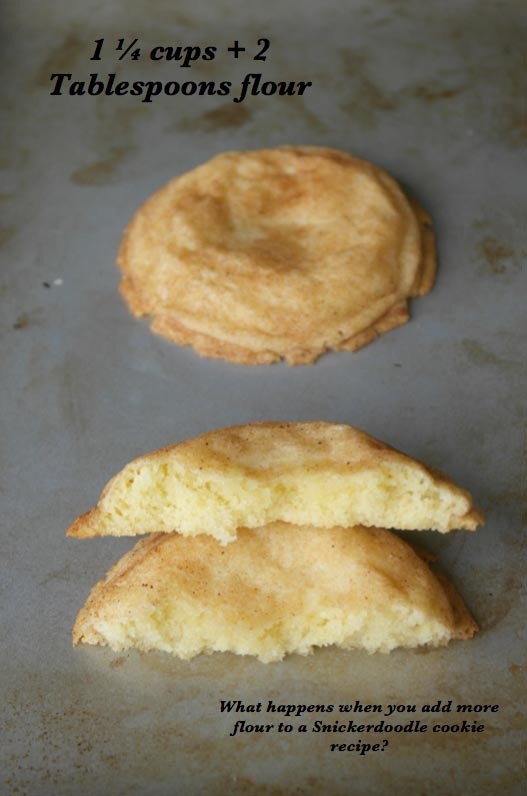 Well, I think all of my early cookie failures made me develop a taste for only thick, fluffy Snickerdoodle cookies. Pish posh on this thin Snickerdoodles! I wanted to have to make an effort to take a bite. But how did I make those cookies so thick and fluffy back in the day? I did a lot of reflecting. Could I have chilled them? No, I didn’t chill my cookies when I was younger, even though mom insisted I didn’t get it. What could’ve happened? Flour. The culprit was flour. Like I’d said: one time I halved the batch and I frequently forgot to halve some major ingredient. 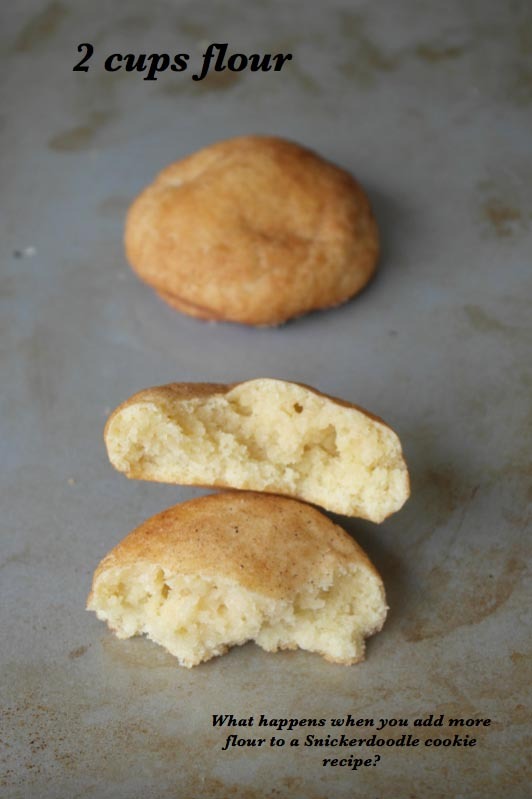 Perhaps flour made fluffy, thick Snickerdoodles? I wanted to test this hypothesis, even though I had a feeling I knew the answer. Hypothesis: More flour in the Snickerdoodle cookie recipe would certainly yield a thicker, fluffier cookie because more flour meant less spread. However, I also was nervous that more flour would lead to less desirable taste because too much flour diminishes the gloriousness of the Snickerdoodle. 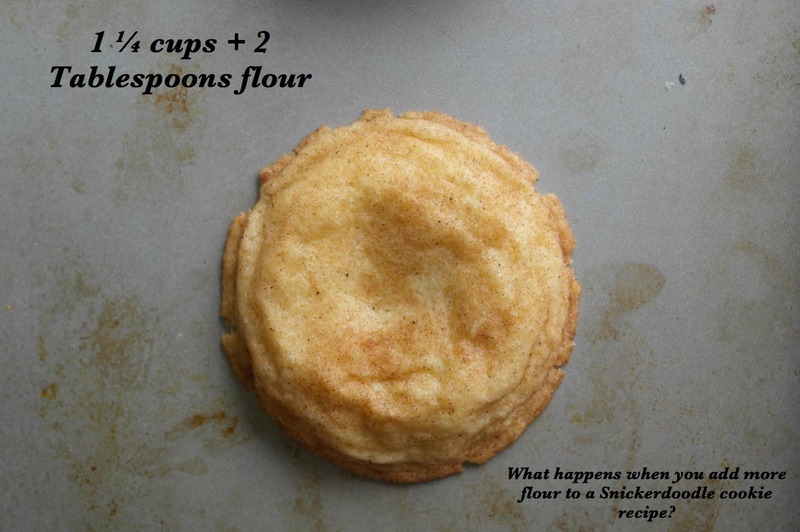 These are my mom’s classic Snickerdoodle cookie recipe and the recipe that I baked many times as a kid. Add the egg and vanilla. Mix until incorporated. Then roll them in the sugar and cinnamon mixture. I tend to go heavy on the cinnamon for maximum cinnamon flavor. The Results: This cookie spread the most by far. They tasted amazing! So much cinnamon. 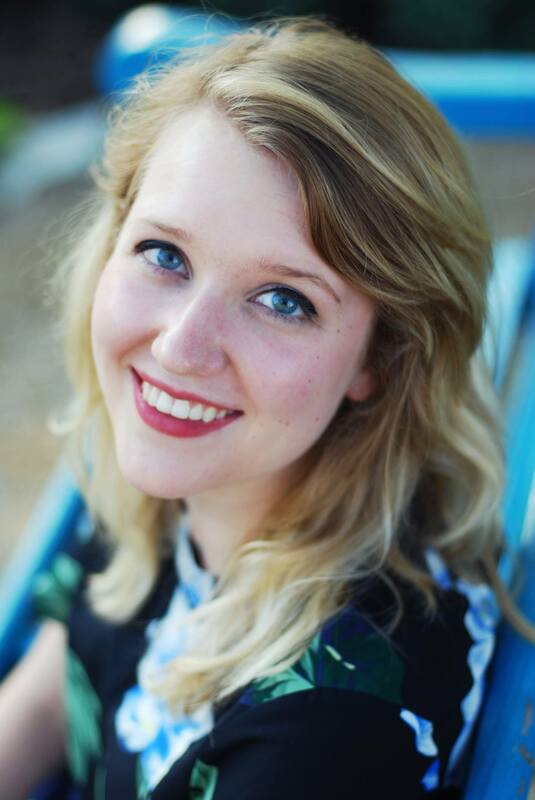 Opinion: Too thin for me! Not enough substance for me. The results: This cookie had the nicest looking edges and the overall baked the best. It was evenly baked throughout. It also tasted delicious! It didn’t have an overpowering flour taste. The opinion: My favorite of the bunch! The results: This cookie spread the least, which isn’t surprising because it had the most amount of flour. However, it did not bake very evenly throughout. The middle was still a bit undercooked while the bottom was overcooked. Also, the “too much flour” flavor started coming through. The opinion: I still liked it better than cookie number one 1 (1 1/4 + 2 Tablespoons), but number 2 (1 3/4) was by far the best. Conclusion: I ended up going with cookie number 2 that had 1 3/4 cups flour. 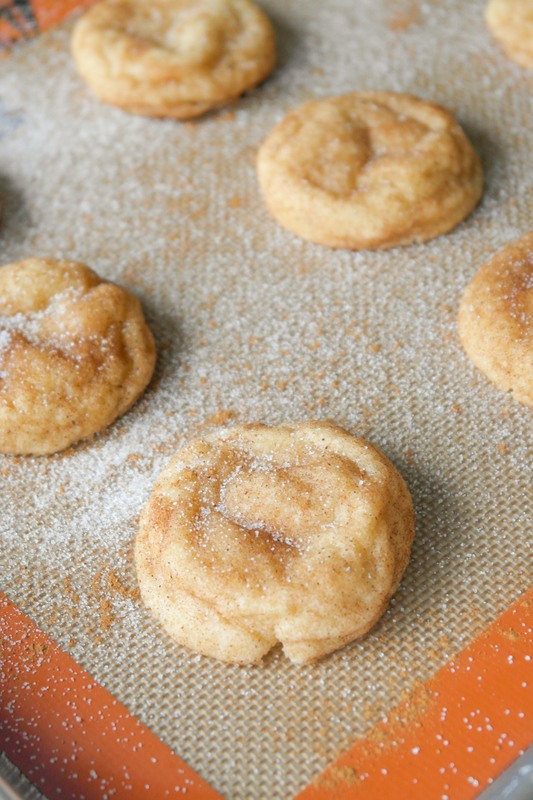 I even posted a beautiful post about Snickerdoodle cookies with that recipe! What fun! I can’t wait for the next experiment. A hint: lots of chocolate involved! I am looking forward to some this weekend. Hi Dad!!!! Thanks for the comment 😉 Yours make me the happiest. 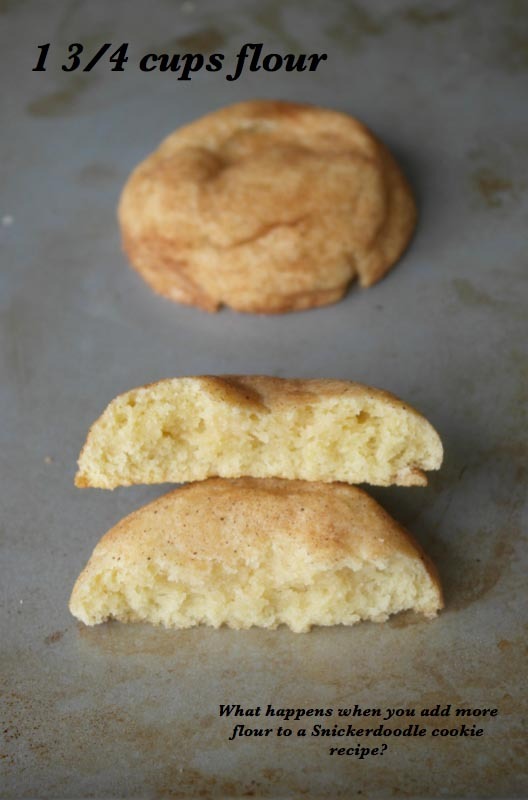 Are Snickerdoodles your favorite?